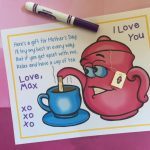 The FreeKidsCrafts team is gearing up for Mother’s Day with this Mothers Paper Chain when everybody wants to be sure that Mom knows just how much she is appreciated. Print out our list of reasons why you love her every day or make up your own. Make your chain as long as you would like. Cut out each strip and make a chain interlinking the circles. 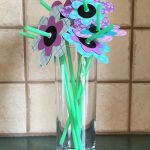 Decorate with foamy flowers if you like or any other treasures. It is also perfect if just decorated with love. Give to Mom with a hug and a kiss. On Mother’s Day, we give you some interesting trivia on how this day came into being and what makes it so special. Thanks for the input. Will keep it in mind.